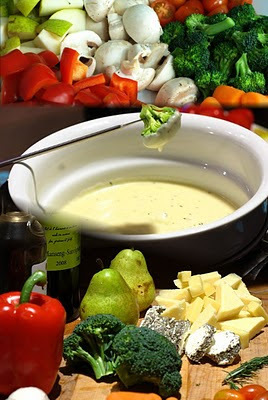 Tonight we made cheese fondue using Swiss, cheddar and goat cheese. The cheese was chopped into cubes and lightly coated it with corn starch to make sure it thickens when it melts. We boiled a cup of white wine and added the cubes of cheese as well as a tablespoon of Kirsch. Instead of just dipping bread we chopped up tomatoes, broccoli, mushrooms, carrots, red peppers and pears. We also had an assortment of crackers which go great with cheese. This was really delicious and you could use any kind of cheese to make it. We will definitely try this recipe again.